The oriental melon (Cucumis melo Makuwa Group), also known as the Korean melon, is a type of muskmelon that is cultivated in East Asia. Phylogenetic studies tracing the genetic lineage of the plant suggest that it may have originated in eastern India, having then spread to China over the Silk Road, from which it was introduced to Korea and Japan. Its flavour has been described as a cross between a honeydew melon and a cucumber. It is noticeably less sweet than western varieties of melon, and consists of about 90% water. The fruits are commonly eaten fresh; with its thin rind and small seeds, the melon can be eaten whole. The Korean name chamoe (참외 [tɕʰa.mwe]) is a composite of words: cham meaning "true" or "real" and oe meaning "cucumber (melon)". It is thought that the oriental melon was introduced to Korea through China during the Three Kingdoms period. The fruit has long enjoyed popularity in Korea, where it is considered the representative fruit of summer. Oriental melons are commonly made into a side dish, calleed chamoe-jangajji, whereby they are pickled with spices. In 2017, 41,943 hectares (103,640 acres) of land was used for their cultivation, yielding about 166,281 tonnes (183,293 short tons) of melons. Seongju County in North Gyeongsang Province, South Korea is famous as the centre of oriental melon cultivation in Korea, with farms in the area comprising 70% of total production in the country. In Japanese, they are called makuwa uri (真桑瓜 [ma.kɯ̟.wa ɯ̟ɾi]). Oriental melon seeds have been found in Jōmon period archaeological sites, attesting to the long history of cultivation in Japan. The name makuwa uri is said to derive from the village of Makuwa, in the ancient province of Mino (now part of Motosu, Gifu), which became known for its high-quality Oriental melons in the 2nd century AD. 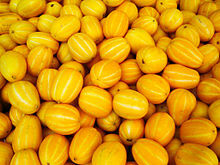 They were once widely eaten in Japan, having been so common that the general word uri (瓜), meaning gourd or melon, came to refer specifically to the Oriental melon. Starting in 1925, when the first western melon cultivars were introduced, the Oriental melon began to fall out of favour among wealthy consumers, and by the late 20th century came to be thought of as a peasant food. It is commonly used as an offering during the Bon Festival, with the period around the festival considered to be the best time to harvest them (shun, 旬). Unripe melons are often made into various kinds of tsukemono (pickles). The plant was first classified as "Cucumis melo L. var. makuwa" in 1928 by Japanese botanist Tomitaro Makino. The current accepted botanical name is "Cucumis melo L. (Makuwa Group)". Makino's proposed name remains recognised as a synonym. The oriental melon is a cool sub-temperate crop, growing best with day temperatures between 24 and 28 °C (75 and 82 °F) and night temperatures between 16 and 24 °C (61 and 75 °F). It requires good sunlight and rich, well-drained, friable, and moisture-retaining soil. It is drought tolerant, but requires sufficient water for optimal growth. The plant, a cucurbit, is an annual herbaceous plant that branches and trails. The stem is angular and hirsute (hairy) and 7 millimetres (1⁄5 in) in diameter. The leaves are reniform (kidney-shaped) with 5-7 lobes. It is andromonoecious (both bisexual and male flowers on same plant) with yellow flowers. There are many varieties of oriental melon. The most well-known variety is called ginsen makuwa (銀泉まくわ) in Japanese and euncheon-chamoe (은천참외) in Korean. Euncheon is the Korean reading of the Chinese characters used in the Japanese name. This type of melon was developed in Toyama, Japan, where it is now recognised as a "traditional vegetable". It was introduced into Korea in 1957, rapidly became the dominant commercial variety there, and its descendants remain so today. Varieties developed from the euncheon include: sin-euncheon ('new euncheon'), developed in the 1970s, and geumssaragi-euncheon (금싸라기은천, 'gold dust euncheon'), developed in 1984, which is now dominant. It is yellow in colour, typically about 6 inches (15 cm) long, and weighs about 1 pound (450 g). It is smooth and oblong, with white stripes that run the length of the fruit. It has white flesh that is juicy and sweet, and is filled with small white seeds. Other cultivars are coloured green and ivory, and vary from spherical to oblong in shape. There are two major landraces of chamoe in Korea: sunghwan-chamoe (성환참외), also known as gaeguri-chamoe (개구리참외, 'frog chamoe'), and Gotgam-chamoe (곶감참외). The gotgam-chamoe is particularly unique, having the aroma of a dried persimmon (called gotgam in Korean), from which it takes its name. These two landraces contain more nutrients and have greater disease resistance than other varieties. A variety called the Golden Makuwa (黄金まくわ) is recognised by the government of Nara Prefecture as a "Yamato vegetable" (大和野菜), a distinction indicating its importance in that region's agricultural and culinary tradition. It has golden skin, white flesh, and usually weighs about 300 grams (11 oz). In 1955, Golden Makuwa comprised 85.6% of all melons (western and oriental) sold at the Osaka Central Wholesale Market. Another variety, the New Melon (ニューメロン), is spherical, has a greenish-yellow skin, green flesh, and usually weighs about 300–400 grams (11–14 oz). In 1962, the Sakata Seed Company crossbred this with the Charentais melon, a type of European cantaloupe, to produce the Prince Melon (プリンスメロン), which quickly became the dominant commercial melon variety in Japan. Prince melons weigh between 500 and 600 grams (18 and 21 oz), have a greyish-white skin, and orange flesh. The development of sweeter and easier to produce varieties of hybrid melon, most notably the Prince, led to a rapid decline in cultivation of oriental melons in Japan. South Korea National Treasure numbers 94 and 114 are both formed in the shape of a oriental melon. The annual Yeoju Geumsa Oriental Melon Festival (여주 금사참외축제) is held once a year, and visitors can sample the melons there. There is a Oriental Melon Ecology Center in Seongju County, designed to educate the public regarding the cultivation and other aspects of the fruit. Included in a collection of drawings of Japanese yōkai by 17th century artist Yosa Buson is a depiction of an "oriental melon monster" (真桑瓜のばけもの, makuwauri no bakemono). A sign that promotes 'the birthplace of the oriental melon' was erected at Kitagata-Makuwa Station in the city of Motosu, Japan, the site of the former village of Makuwa. 18th century drawing by Yosa Buson of an "oriental melon monster". ^ Shin, Ah-Young; Kim, Yong-Min; Koo, Namjin; Lee, Su Min; Nahm, Seokhyeon; Kwon, Suk-Yoon (4 January 2017). "Transcriptome analysis of the oriental melon (Cucumis melo L. var. makuwa) during fruit development". PeerJ. 5: e2834. doi:10.7717/peerj.2834. ISSN 2167-8359. PMC 5217523. PMID 28070461. ^ Katzir, Nurit (2000). Cucurbitaceae 2000: Working Group on Curcurbitaceae. Acta Horticulturae. 510. p. 391. ISBN 978-9066058521. ^ a b c d e f g h i j k l m n o Lim, T. K. (2012). "Cucumis melo (Makuwa Group)". Edible Medicinal and Non-Medicinal Plants. pp. 219–221. doi:10.1007/978-94-007-1764-0_34. ISBN 978-94-007-1763-3. ^ a b c d e "Oriental melon". Information Village Network. Invil Central Council. Retrieved 13 July 2014. ^ a b Kato, K.; Akashi, Y.; Tanaka, K.; Wako, T.; Masuda, M. (2001). "Genetic characterization of east and south Asian melons, Cucumis melo, by the analysis of molecular polymorphisms and morphological characters". Acta Hort. 588: 217–222. ^ a b c 大和の農業技術発達史 : 奈良県農業試験場百周年記念誌 [Yamato no nōgyō gijutsu hattatsu-shi: Nara ken nōgyō shikenjo hyakushūnen kinenshi] (in Japanese). 奈良県農業試験場. 1995. p. 102. ^ a b c "韓国農水産食品-チャメ（マクワウリ）[Kankoku Nōsui-san shokuhin - chame (makuwauri)]". atcenter.or.jp (in Japanese). Korea Agro-Fisheries Trade Corporation. Retrieved 17 September 2018. ^ a b Boerman, Esther (7 February 2005). "All about melons". The Argus-Press. Owosso, Michigan. Retrieved 12 July 2014. ^ Kitamura, S. (1950). "Notes on Cucumis of Far East". Acta Phytotaxon Geobot. 14: 41–44. ^ "채소생산량(과채류)". Korean Statistical Information Service (in Korean). Statistics Korea. 6 September 2018. Retrieved 19 September 2018. ^ 日本語源大辞典 [Nihongogendaijiten] (in Japanese). 小学館 [Shogakukan]. 2005. p. 65. ^ 西村毬子 (2000). 日本見聞録にみる朝鮮通信使 [Nihon kenmonroku ni miru Chōsen tsūshinshi] (in Japanese). 明石書店 [Akashi Shoten]. p. 344. Retrieved 13 September 2018. ^ "固い皮の中は謎だらけ、「メロンパン」の形はどこからやって来たのか". JBpress（日本ビジネスプレス） (in Japanese). 8 March 2013. Retrieved 13 September 2018. ^ "マクワウリ（真桑瓜/まくわうり）：特徴と旬の時期や主な産地 [Makuwauri: Tokuchō to shun no jiki ya omona sanchi]". 旬の食材百科 (in Japanese). Retrieved 13 September 2018. ^ "園芸試験場報告: 久留米. D" (in Japanese). 農林省園芸試験場久留米支場. 1963: 54. ^ Kirkbride, Joseph H. (1993). Biosystematic Monograph of the Genus Cucumis (Cucurbitaceae): Botanical Identification of Cucumbers and Melons. Parkway Publishers, Inc. p. 110. ISBN 9780963575203. ^ "Cucumis". MULTILINGUAL MULTISCRIPT PLANT NAME DATABASE. Retrieved 9 November 2018. ^ "北陸の地方野菜". maff.go.jp (in Japanese). Hokuriku Regional Agricultural Administration Office. Retrieved 18 September 2018. ^ "Yeoju Golden Melon". Information Network Village. Invil Central Councill. Retrieved 18 September 2018. ^ 김영훈 (18 June 2018). 단어로 읽는 5분 한국사 (in Korean). 글담. ISBN 9791186650. ^ 황교익 (11 September 2011). "연하고 작은 참외가 훨씬 더 맛있다". Weekly Dong-A (in Korean) (795). Retrieved 19 September 2018. ^ "Chamoe: A must-eat summer melon · bburi kitchen". bburi kitchen. 10 June 2015. Retrieved 19 September 2018. ^ 편집부 (19 November 2017). 농산물 백과사전 작물농업과 작물재배 (in Korean). Kyobobook MCP. p. 18. ISBN 9788969107046. Retrieved 19 September 2018. ^ Grumet, Rebecca; Katzir, Nurit; Garcia-Mas, Jordi (13 October 2017). Genetics and Genomics of Cucurbitaceae. Springer. ISBN 9783319493329. ^ デジタル大辞泉プラス [Digital Daijisen Plus]. "銀泉まくわ". コトバンク (in Japanese). Retrieved 18 September 2018. ^ a b c Park, Inkyu (2013). "Development of SSR markers by next-generation sequencing of Oriental landraces of chamoe (Cucumis melo var. makuwa)". Molecular Biology Reports. 40 (12): 6855–6862. doi:10.1007/s11033-013-2803-0. PMID 24096890. ^ "黄金まくわ/奈良県公式ホームページ [Ōgon makuwa/Nara ken kōshiki hōmupēji]". pref.nara.jp (in Japanese). Nara Prefecture. Retrieved 14 September 2018. ^ "まくわうり 「黄金まくわうり」 ｜商品情報いろいろ検索｜タネ・苗・園芸用品・農業用資材の総合案内：サカタのタネ". sakataseed.co.jp (in Japanese). Sakata Seed Corporation. Retrieved 17 September 2018. ^ 図説　果物の大図鑑 [Zusetsu kudamono no daizukan] (in Japanese). マイナビ出版 [Mynavi Publishing]. 31 October 2016. p. 173. ISBN 9784839953843. ^ Shinohara, Suteki (1984). Vegetable Seed Production Technology of Japan Elucidated with Respective Variety Development Histories, Particulars. Shinohara's Authorized Agricultural Consulting Engineer Office. p. 362. ^ "Episode 07 メロン｜サカタのタネ 100周年記念特設サイト PASSION in Seed 100 years" (in Japanese). Sakata Seed Corporation. Retrieved 17 September 2018. ^ Nishimura, Shigeo (2002). Proceedings of the IInd International Symposium on Cucurbits: Tsukuba, Japan, 28 September-1 October, 2001. International Society for Horticultural Science. p. 198. ISBN 9789066057760. ^ "メロン 「プリンスメロン」｜商品情報いろいろ検索｜タネ・苗・園芸用品・農業用資材の総合案内：サカタのタネ". sakataseed.co.jp (in Japanese). Sakata Seed Corporation. Retrieved 17 September 2018. ^ a b "Oriental Melon Ecology Center". Invil Central Council. Retrieved 13 July 2014. ^ "Koreas Treasure No. 114". SkyNews (Korean Air Lines Co., Ltd.). Retrieved 13 July 2014. ^ "Yeoju Geumsa Oriental Melon Festival (여주 금사참외축제)". Korea Tourism Organization. Retrieved 9 July 2014. ^ Hyōgo Prefectural History Museum. ; Kyōto International Manga Museum (2009). 図說妖怪画の系譜 [Zusetsu Yōkaiga no keifu] (in Japanese). Tokyo: Kawade Shobō Shinsha. pp. 12–14. ISBN 9784309761251. ^ "岐阜：マクワウリの発祥地に看板　北方真桑駅で除幕式". 毎日新聞 (in Japanese). 28 June 2018. Retrieved 14 September 2018. This page was last edited on 31 March 2019, at 15:23 (UTC).